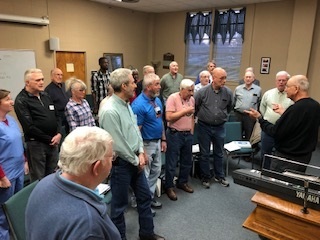 We rehearse every Tuesday evening from 6:30 to 8:30 PM at First Baptist Church, 600 Governors Dr. SW, Huntsville, AL 35801. Parking is behind the building and free, just come to Entrance #7 and contact 256-653-4830. Guests are welcome at every rehearsal. As a first-time guest, we will ask you a few questions about your singing background and our director will help you select the proper barbershop part (tenor, lead, baritone, or bass) for your range. Then we will give you some music and start singing right away! We will ask an experienced member of your section to sing next to you so he can answer any questions you may have as the evening progresses. Don’t worry if you can’t read sheet music. We provide learning CDs for most of our songs and you can learn to read barbershop sheet music as your love for the hobby grows. All you need is the ability to match a pitch being played or sung. We can teach you the rest. We start each rehearsal with a socializing, learning tags (quick endings to song) from 6:00 - 6:30. Announcements and some stretching at 6:30, some music theory at 6:45, breaking down the week's song at 7:00, break into sectionals at 7:15, and rehearse complete songs at 8:00. 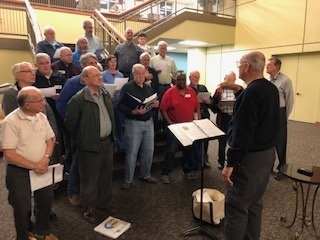 We are a performing chorus with over a 12-15 performances every year, so we are constantly reviewing our repertoire and learning new songs for upcoming performances.